Bald Eagles are breeding once again in the Central California Coast Region, thanks to a successful re-introduction project conducted by Ventana Wildlife Society, in cooperation with U.S. Fish and Wildlife Service and California Department of Fish and Game. Breeding Bald Eagles were absent for most of the last century in Central California after the devastating effects of DDT brought the bird to near extinction. Once the DDT ban paved the way for recovery, we set about reintroducing Bald Eagles in Central California. From 1986-2000, we released 70 juvenile Bald Eagles at our private wildlife sanctuary located in Big Sur, CA. Our goal was establishing a self-sustaining population in Central California that would consist of at least four breeding pairs. The live video stream below is provided by Camp Roberts Installation, in San Luis Obispo County, California and powered by HDOnTap. This is one of about 30 breeding pairs now established in central California. The best viewing time is in the morning before heat and wind pick up - enjoy! 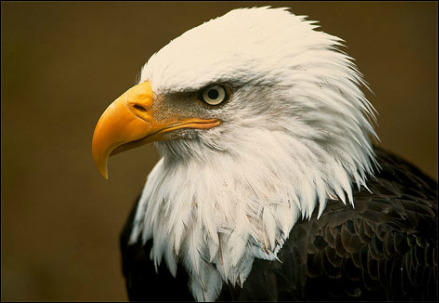 Did you know that bald eagles are the fastest growing bird in North America? The chicks grow on average of 6 oz per day and reach the size of their adult parents in just 10 to 13 weeks in age, which is the age range for fledging (to leave the nest). Females are much larger than the males so the males leave the nest earlier than the females do. Check out this field guide to see the rapid changes chicks undergo in such a short time. Look for this chick to fledge sometime around early June. We released 70 juvenile Bald Eagles in central California. ​ and continues to grow. Due to the support of members, private foundations, and corporations, we were successful. In 1993, Ventana Wildlife Society documented the first successful Bald Eagle nest in Central California in nearly 60 years. Progress did not end there. Since that benchmark year, we have documented a considerable increase in the Central California nesting population through annual surveys led by Ventana Wildlife Society co-founder Sal Lucido and a team of devoted volunteers. In 2012, we confirmed 26 occupied territories, and 33 fledged young. Volunteers discovered and monitored six new Bald Eagle nests in 2012, demonstrating the northward expansion of the breeding population into Santa Clara, Santa Cruz, and Alameda counties. In 2007 Bald Eagles were delisted, marking a major milestone in the recovery of this species. growth. Journal of Raptor Research 51:145-152. ​025 Thorngate, N. 2004. Bald Eagle Management Plan. Ventana Wildlife Society Technical Report #025 to California Army National Guard, Camp Roberts, Big Sur, CA. 030 Thorngate, N. 2005. Bald Eagle Monitoring at Camp Roberts California Army National Guard Training Facility. Ventana Wildlife Society Technical Report #030 to California Army National Guard, Camp Roberts, Big Sur, CA. 038 Thorngate, N. 2006. Bald Eagle Monitoring at Camp Roberts California Army National Guard Training Facility, 2006. Ventana Wildlife Society Technical Report #038 to California Army National Guard, Camp Roberts, Big Sur, CA. 044 Burnett, J. and K.J. Sorenson. 2007. Ventana Wildlife Society’s Bald Eagle and California Condor Restoration Program: 2006 Annual Report. Ventana Wildlife Society Technical Report #044 to U.S. Fish and Wildlife Service, Salinas, CA. 057 Tomassi, S., K. Sorenson, and S. Jackson. 1999. 1999 Final Report: Bald Eagle Reintroduction and Nest Monitoring on the Central California Coast. Technical Report #057, Ventana Wildlife Society, Salinas, CA. 059 Sorenson, K., L. J. Burnett, J. Steffen, and S. Lucido. 2001. Bald Eagle and California Condor Restoration in the California Central Coast region: 2001 Final Report. Technical Report #059, Ventana Wildlife Society, Salinas, CA. 081 Ventana Wildlife Society. 2013. Eagle Conservation Plan for Camp Roberts California National Guard Training Site 2013. Ventana Wildlife Society Technical Report #081 to California National Guard, Camp Roberts, California.